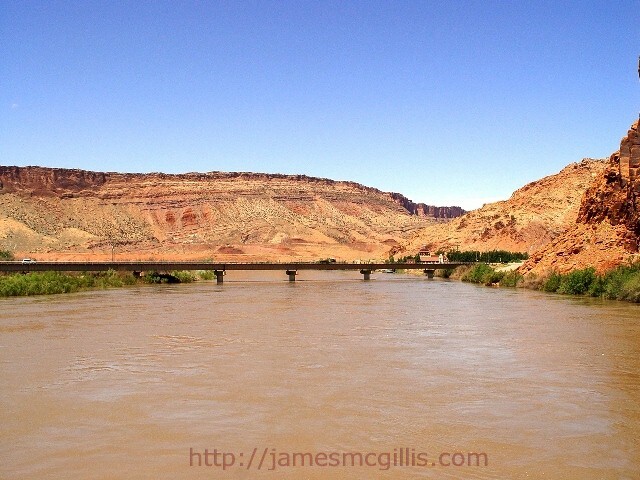 Current-Era History in Moab, Utah Began at the "Jumping Off Place"
On Sunday, June 10, 1855, members of the Mormon Elk Mountain Mission crossed the Grand River at a place near Moab, Utah. After crossing that torrent, their likely first camp was at a place that we now call the Moab “Lions Park Transit Hub”. In the 1850s, there was no graceful concrete highway bridge or steel-truss pedestrian bridge at the site. Instead, the settlers found a “jumping off place”, which was a perpendicular ledge standing twenty-five feet above the river. In order to make the crossing, the men of the Elk Mountain Mission were obliged to “take their wagons to pieces” and lower them down by ropes. After ferrying their wagons and supplies across the river, the settlers made their first camp. Soon after, they built a stone and wooden fort in what is now the Scott M. Matheson Wetlands Preserve. During their spring and summer in Moab, misunderstandings between the Elk Mountain Mission and local Paiute or Southern Ute Indians escalated into a shooting war. Before the beginning of winter 1855, the Mormons lost several of their members to Indian bullets, clubs or arrows. With looming crop failure, unexpected flooding and a plague of mosquitoes along the river bend, the remaining members of the mission abandoned the area and high-tailed it back to Green River and then on to Salt Lake City before year's end. In the 1880s, the commencement of ferryboat operations across the Colorado River at Moab enhanced the riverside location’s status as a “transit hub” for the humble settlement. Operating near the site of the present U.S. Highway 191 Bridge, the original, oar-powered ferryboat was only twenty-eight feet long. To prevent capsize, wagons were dismantled at the riverbank, ferried across and then reconstructed on the far side. Perhaps this is why early travelers called Moab "The Far Place". Until the early twentieth century, ferrying, fording or paddling remained the only modes of transport across the Colorado River at Moab. 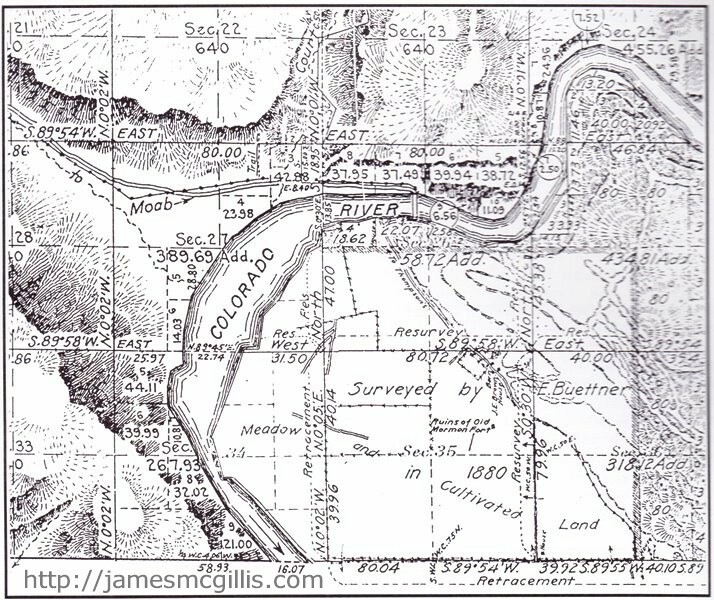 Ironically, the Moab survey map dated 1880 appears to show a bridge across the Colorado River almost exactly where the current double-span highway bridge now stands. According to conventional Moab history, it would be thirty-two more years before the 1912 highway bridge spanned the river near the "jumping off place". 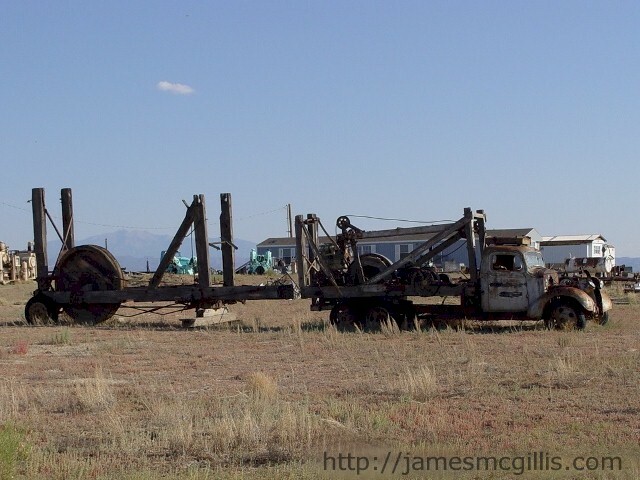 In 1912, "slightly radioactive Vanadium" (having a half-life of >3.9×1017 years) was discovered in nearby Cisco, Utah. 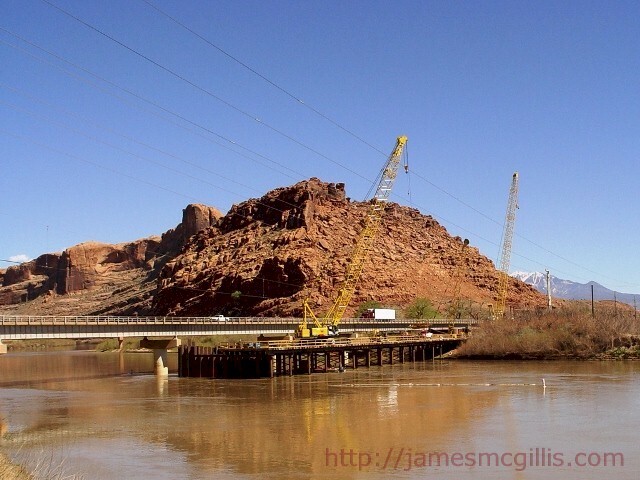 Also that year, the Utah state legislature authorized funding for a triple-span steel bridge across the Colorado River at Moab. With a length of 620-feet, that first highway bridge opened up commerce from Moab to the north. The Denver & Rio Grande Railroad siding at Brendel, thirty miles to the north became a transit point for agricultural and manufactured goods. By the time refrigerated rail cars became available, Spanish Valley peaches, many larger than a softball, became famous in Eastern cities. 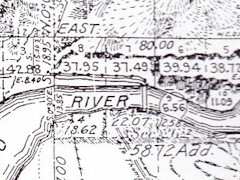 Although accurate flow measurements of the Colorado River were not available in 1912, locals knew from previous floods that the highway bridge should stand high above the river. As a testament to their prudent planning, a sandstone bridge abutment still stands on the north bank, as high and strong as the day it was finished, over one hundred years ago. On the south bank, the 1912 highway bridge terminated near the same spot where the current Riverway pedestrian bridge begins its own 620-foot span of the river. Previously known to all as the Grand River, in 1921 Congress bowed to political pressure and erroneously renamed the currently recognized river as the "The Colorado River". 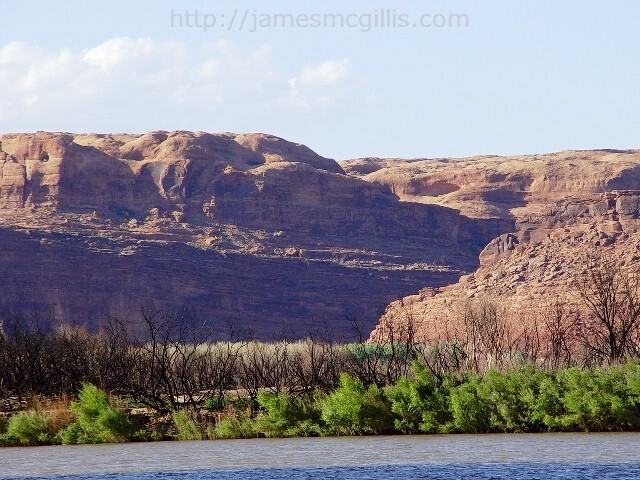 Although it is a longer and stronger tributary to what we now call the Upper Colorado Basin, the Green River received no credit in the history books. Instead, the Colorado River became the politically correct source of the mighty river well-known for its creation of the Grand Canyon. Red, green; if you plan to recreate history on your own terms, what is the difference? 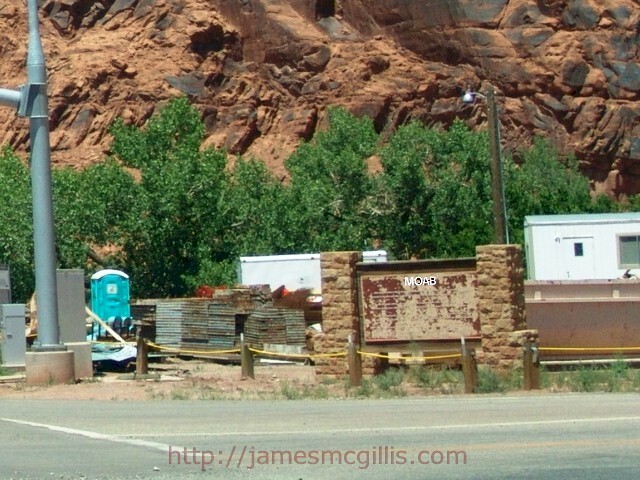 According to Moab native Mrs. Verlyn Westwood (1936-2009), there was once a guard shack on the north bank, across from what later would become Lions Club Park. 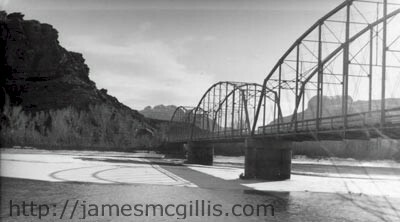 During World War II, two men took turns guarding the old Colorado River highway bridge. With little vehicular traffic crossing the bridge at Moab, nighttime guard duty was lonely and quiet. On a night uncertain, a large boulder came loose from the canyon rim above. Without warning, the errant boulder crashed down upon the guard shack, crushing to death Mr. Otto Ellis, who was standing guard that night. Decades later, some local residents suggested the erection of a memorial plaque at that site. 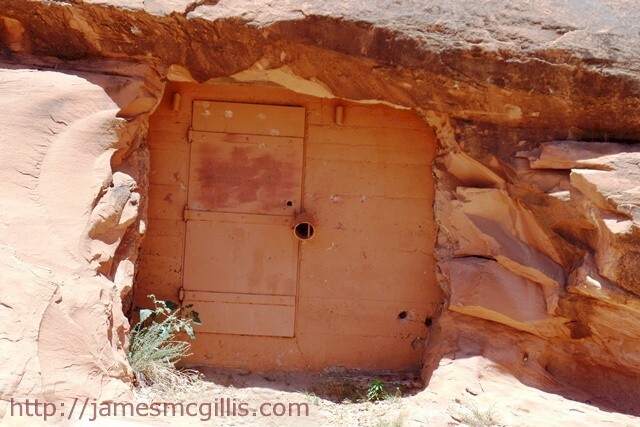 If you research “Lions Club Park, Moab, Utah”, there are few historical references to the place. For decades, a masonry and wooden historical sign stood at the park. The sign stood at a diagonal, facing the intersection of U.S. Highway 191 and Utah State Route 128. From its fading and flaking text, we know that the Lions were still adding improvements to the park well into the 1980s. 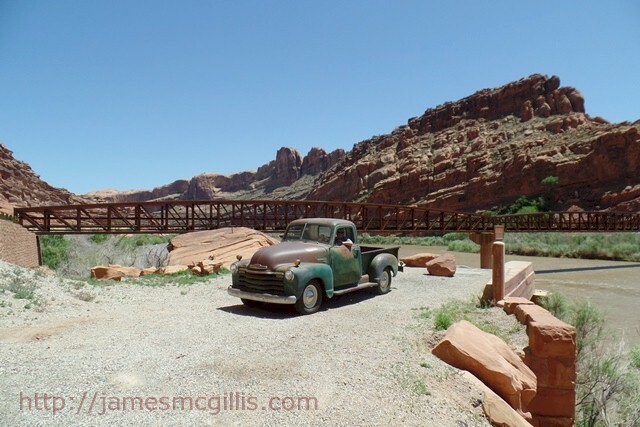 Sometime after its inception in 1940, the Lions Club of Moab adopted and named the park. With tacit blessings from the City of Moab and Grand County, the Lions Club installed pit toilets and built a kitchen building. From a paved parking lot, concrete walkways led to picnic tables, shaded by immense Fremont Cottonwood trees. With a natural water source nearby, the club created Lions Park Spring, which was lesser known than “Matrimony Spring”, just across State Highway 128. With its shady glen, lush trees and access to the Colorado River, it is easy to imagine many a local marriage celebrated at the park. On Saturday, Sept. 24, 2005, from 1 to 3 PM, the Moab Lions Club celebrated its 75th anniversary at Lions Park. By then, the word “Club” had disappeared from the official name of the park. On that fall day in 2005, former members and Lions from neighboring communities joined local Lions for lunch and a program. 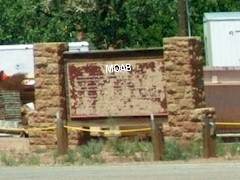 In 2007, the Moab Lions Club was active in the area. News reports indicate that Moab Lions members conducted a highway clean up in both the spring and fall, picking up trash along the highway between Lin Ottinger's Rock Shop and the Colorado River Bridge. In addition, the Moab Lions Club worked to clean up the Lions Park area, removing weeds and trash. Planning for reconfiguration of the area around Lions Park had been underway since 2001. In 2003, Utah State University produced concept drawings of the area. In 2007, Grand County created a task force to develop recommendations for the project area. With help from the National Park Service, the task force became the Lions Park Planning Group (LPPG). 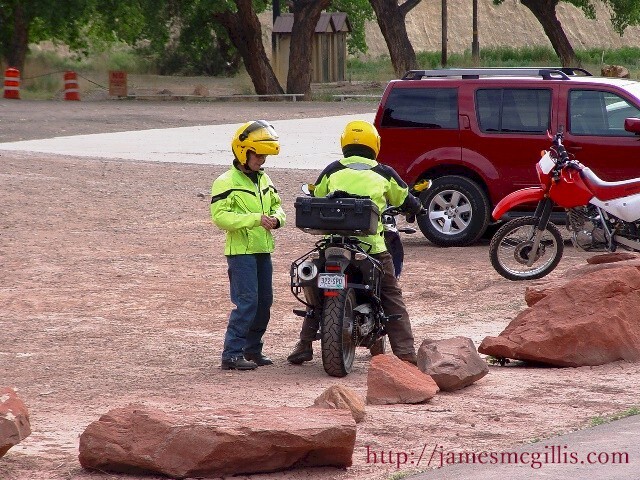 The LPPG included Moab City, Grand County, National Park Service (NPS), Bureau of Land Management (BLM), Sovereign Lands, Trail Mix, Moab Trail Alliance and the Lions Club. 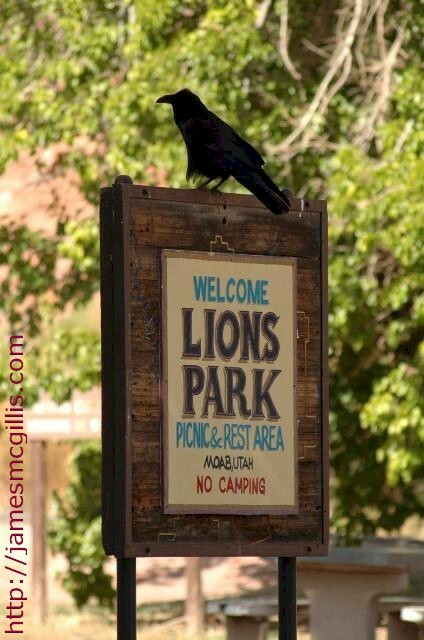 In May 2010, Moab Happenings published an article about the upgrading and expansion of Lions Park. Soon it would extend beyond its tiny niche on the east side of the highway bridge. The long-term goals got a boost with the opening of the Colorado Riverway Bridge in 2008. That 620-foot bicycle and pedestrian bridge took nine years of work, from concept to completion. “We want to allow people to connect to the Southwest and Moab in a way that is memorable forever,” said Reci Peterson, an interpretive planner and consultant for Psomas Design of Salt Lake. The Grand County Historical Preservation Commission (HPC) proposed that the area be designated a historic district. HPC members argued for recognition of numerous cultural and archaeological resources and sites near the park. 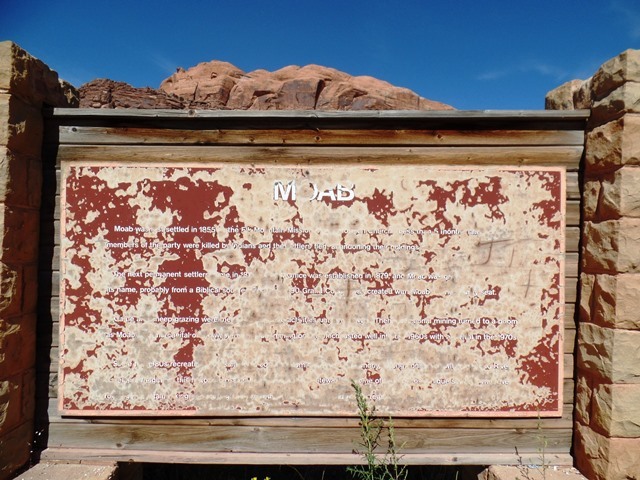 Included on their list were Matrimony Spring, the Moab Panel (Indian rock art), and the World War II bridge-guard station. Members of the HPC wanted recognition of a colorful history of river crossings by such parties as the Spanish conquistadors, early Native American traders, Anglo trappers, the 1855 Elk Mountain Mission and outlaws such as Butch Cassidy. Presenters said that the Lions Park transit-trailhead hub would have as its focal point a “signature building” with a plaza full of interpretive stories and other information. Other features would include picnic tables by the river, grassy and shady areas for play and relaxation, sand and volleyball courts, plus water features using nearby natural springs. Plans included several pavilions for group events, and a gigantic “walk-over” map that park visitors could traverse to see where they are in relation to the river, mountains and geography of Southwest. “This keeps getting better as time goes along,” Community Development Director Dave Olsen said.